Canonization Date: Divine Mercy Sunday, April 27, 2014. This Sunday marks a glorious day when Pope Francis canonizes and declares saints, Blessed Pope John XXIII and Blessed Pope John Paul II. More than 1 million people are expected to enter into the Eternal City, and many more via television and social media to witness an historic event adding to the long list of canonized saints for the universal Church calendar. The origin of the word saint is the Latin word sanctus, which means “holy.” Saints are holy ones whose lives manifest the holiness of God. In Jewish and Christian traditions, the holy ones are those in communion with the living God. Three decades ago, The Catholic Encyclopedia included around 5,000 saints. Some of their lives were recorded in detail, while some remained barely identifiable from mere scraps of information, hearsay, and legend. During the pontificates of Popes John Paul II and Benedict XVI, the roster has grown exponentially and, with the loosening of atheistic Communist control in the countries of the former Soviet Union and China, a tidal wave of saints has been admitted of the canon, swelling the total to around 20,000. Saints tended to be adopted and recognized on a local level for the first thousand years or so of Christianity. Often sainthood was a product of veneration by a saint’s contemporaries, peers, and successors, although increasingly the recognition of a saint was in the gift of the local bishop. During this period, relics (and the possession of them) also became an important aspect of veneration. The many saints who entered the canon in the first millennium of Christian history are referred to as doing so ‘Pre-Congregation.’ The more formal process of recognition evolved from the 10th century as successive bishops of Rome began to assert their exclusive right of recognized saints. Pope Alexander III began a more formal process of the papal recognition of sainthood; this came to involve an advisory ‘congregation’ of senior churchmen. Today, within the Congregation for the Causes of Saints, this involves three main processes: veneration, beautification, and canonization. The Congregation for the Causes of Saints is quite precise in its understanding of holiness. Holiness is the grace of God operating in and through human beings. The congregation’s tests for holiness are also precise—indeed, they are almost schematic. Holiness is manifested by a two-tiered structure of virtues: the three supernatural (so called because they are infused by grace) virtues of faith, hope, and charity (love of God and of neighbor), and the four cardinal moral virtues (originally derived from the ethics of Aristotle) of prudence, justice, fortitude, and temperance. Since all Christians are expected to practice these virtues, a saint is someone who practices them to a “heroic” or exceptional degree. 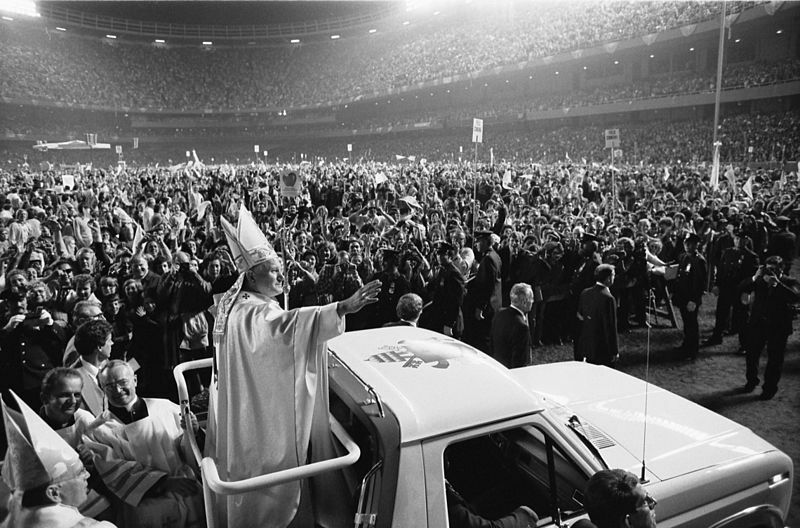 Pope John Paul II at Yankee Stadium in 1979. There is a constant in the identification of Christian saints, namely, the witness to the intimate and infinite love of Jesus Christ. The saints in any age are transparent in their pointing to the new creation in Christ. Grasped by the urgency of the Kingdom of God, a saint is one who inspires and evokes a response from others. The response may be positive or negative on the part of society and on the part of the Church. 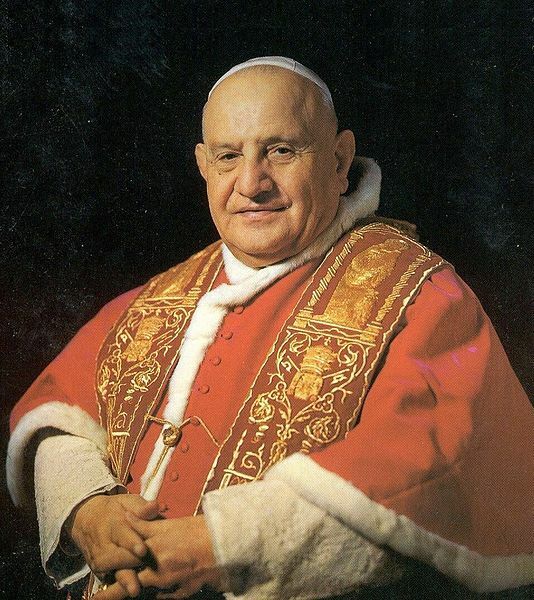 Yet, as Blesseds John XXIII and John Paul II are declared saints, their lives personified and excelled in heroic virtues necessary for the process of canonization and witness to the Kingdom of God. Downey, Michael, ed. “The New Dictionary of Catholic Spirituality.” Collegeville, MN: Liturgical Press, 1993. Woodward, Kenneth. “Making Saints.” New York, NY: Touchstone, 1990.